The flash frenzy continues this week as Nimbus Data positions its new Gemini flash array as high-density, network-agnostic storage for database, enterprise resource planing (ERP), desktop virtualization and other applications. This is just the first of a flood of flash-related news to come as the Flash Memory Summit kicks off in Santa Clara, CA this week and solid-state memory vendors seek to parlay that event — and next week’s VMworld — for maximum exposure. Nimbus Data says Gemini will cut total storage acquisition cost — including software — to $8 per GB from $10 per GB for its current E-Series product. Company CEO and Founder Thomas Isakovich said one of the chief draws of Gemini, due out in the next 60 days, is its fault-tolerant design that suits it for these mission-critical applications. “This goes beyond the power supplies to non-disruptive capacity expansion, non-disruptive software updates,” he said. In addition, Gemini’s density should earn it a look by large companies wanting to save data center real estate and energy, he said. “To put it in perspective we’re about 8 times the efficiency of 15K disks. We can fit 1 PB of capacity in a single rack that would take 8 racks and use 10 times the wattage if you used 15K disks,” he said in a recent interview. This is important as more companies focus “not just on capex but data center opex,” he said, adding: “They’re running out of space and power.” The array also offers software-configurable network interconnects so it can run on Ethernet, Infiniband or Fibre Channel LANs as required. Vendors like Nimbus have to convince companies that flash can last. Longevity is the “number one risk in an all-flash solution,” Woo said. “Disk drives have a very predictable life, you know when they’ll fail and can do things to mitigate that [but] flash is still a question. Nimbus says they’re taking that to a new level, talking 10 year endurance of their flash,” he said. 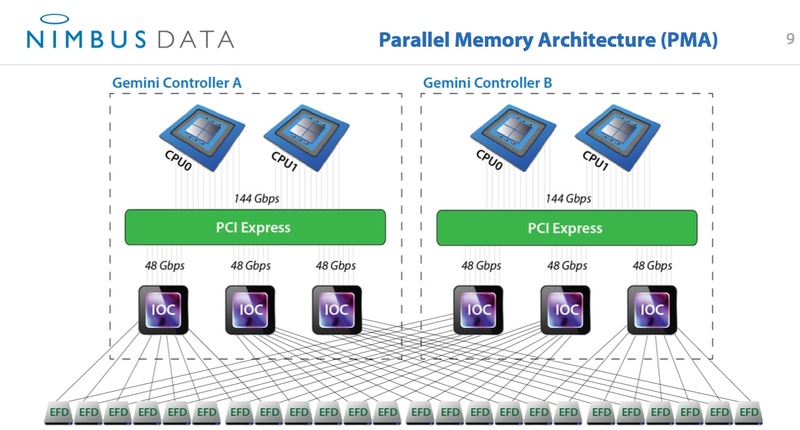 Woo also cited the array’s parallel architecture that helps it drive faster throughput. “This is an opportunity for them to play against the big boys in media and entertainment who need really fast throughput. Nimbus is doing that through a new set of silicon that helps them drive that performance in a parallel versus a serial manner,” he explained. South San Francisco-based Nimbus Data already claims some big customers including Bloomberg LP, Wachovia(s wfc), the State of California,IBM(s ibm) Lucent-Alcatel(s alu), and Stanford University. Solid state storage is definitely a growing market — researcher IDC expects enterprise flash shipments will grow 20 fold by 2016. But the competition is likewise booming with companies from bootstrapped startups to multi-billion-dollar legacy powers all looking for a piece of that action. Last week alone, startup Skyera emerged from stealth, claiming its new all-flash Skyhawk array will cut native flash costs — before compression and deduplication — to an eye popping $3 per GB. A few days later and at the other end of the spectrum, IBM announced plans to buy Texas Memory Systems, a Houston-based flash pioneer. That deal, the terms of which were not disclosed, is seen as a way for IBM to better compete with storage leader EMC (s emc) which ponied up a reported $430 million for EXtremeIO earlier this year. Other entrants include Violin Memory, which just inked a deal to bring Symantec (s symc) data management expertise to its arrays, and Pure Storage which recently logged $40 million in Series D funding. Legacy storage vendors like EMC have touted “tiered” storage — in which companies deploy tape, spinning disks and solid-state or flash memory where each solution is most appropriate. Others like Skyera pretty much tout all-flash-all-the-time. Nimbus Data’s Isakovich holds a more nuanced view. “Flash can be a lot of places but will not clean the floor. Tape is here, it’s not dying, however we think tiering as it’s done by the big boys is a captive solution and is suboptimal for the user. We think users will buy fewer tiers because flash is encroaching on high-end disks. People will buy into open tiers, buying best-of-breed for each layer,” he said.